A photo making the rounds on social media showing a Nigerian aircraft with worn-out tyre has emerged as fake. 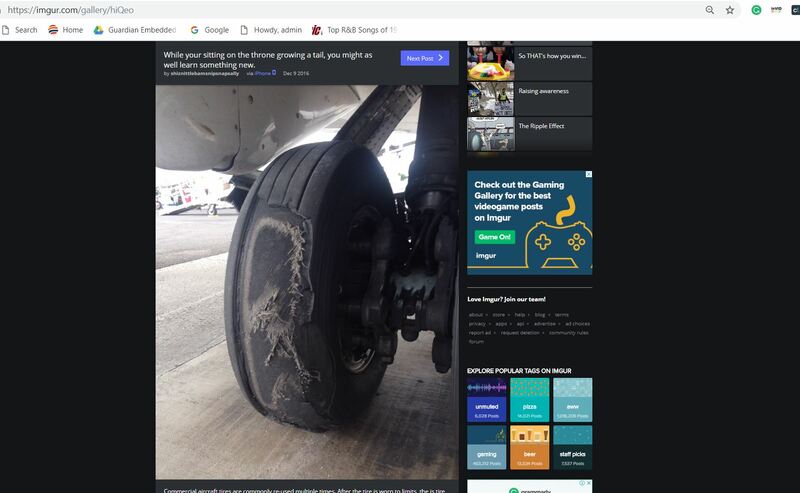 A popular online medium shared the photo of a badly damaged tyre, with the first layer already peeled off, but still on the wheel of an aircraft supposedly used by an airline in Nigeria. The photo was credited to a musician, Oluwarotimi Martins, popularly known as Alariwo of Africa. “While you are sitting on the throne growing a tail, you might as well learn something new. Commercial aircraft tyres are commonly re-used multiple times,” Shiznittlebamsnipsnapsally said in the Imgur post. Alariwo, who was quoted to have shared the image, however, told The Guardian that the post was not from him. He said his personal assistant who manages his social media tools shared the image. Alariwo denied knowledge of where the photo originated, citing that the PA had been travelling round “and would have picked the image from an airport”. “But what gets me annoyed is the fact that he did not mention any airline. So, what are all these reactions all about? If he had mentioned this or that airline, then they can make claims. But he did not. “The truth is that the post has nothing to do with me. Yes, the page belongs to me but he (PA) is the one using it. My only quarrel with him is that he mentioned Nigeria,” Alariwo said. The Nigerian Civil Aviation Authority (NCAA) denied the possibility of any Nigerian airlines to deploy worn-out or faulty equipment amid stringent routine inspections for airworthiness. Spokesperson of NCAA, Sam Adurogboye, said the veracity of the photo was yet to be established. Adurogboye said in line with International Civil Aviation Organisation (ICAO) Standard and Recommended Practices (SARPs) and Nigeria Civil Aviation Regulations (Nig.CARs), no airline operator could embark on commercial air transportation for hire and reward without airworthy operating aircraft. He added that NCAA’s Aviation Safety Inspectors (ASI) are well trained and well motivated to carry out routine ramp inspection on all airlines operating in Nigeria. “It is the primary responsibility of the Authority Inspectors to ensure that all the parts of the aircraft comply with the applicable airworthiness requirements and remains in a condition for safe operation before every flight and throughout its operating life. Operators have also faulted the post, describing it as an attempt to sabotage their businesses.